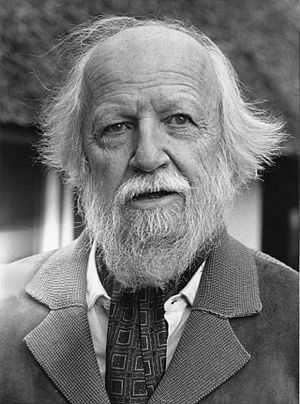 Sir William Golding (19 September 1911 – 19 June 1993) was an English writer. He was a novelist, poet, playwright and teacher. He is famous for his novel Lord of the Flies. He received the Nobel Prize for Literature in 1983. In 2008, The Times ranked Golding third on its list of "The 50 Greatest British writers since 1945". Golding was born in Newquay, Cornwall, England on 19 September 1911. He grew up in Marlborough, Wiltshire. 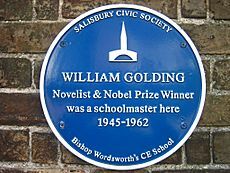 His father, Alec Golding, was a schoolmaster at Marlborough Grammar School. Golding and his older brother, Joseph, went to their father's school. In 1930, Golding went to Brasenose College at the University of Oxford. He studied Natural science and then English literature there. Golding graduated with an MA in 1935. Golding then worked as an actor, producer and a writer. Then he became a teacher at Bishop Wordsworth's School, Salisbury. Golding joined the Royal Navy in 1940. When World War II ended, Golding continued teaching and writing. He left Bishop Wordsworth's School in 1961 and began writing full-time. Golding's first published novel was Lord of the Flies. Golding used his experience of the Second World War and his teaching knowledge of children to write the book. Lord of the Flies is a story about a group of school boys who are trapped on a desert island. The children quickly become savages and begin to murder each other. The novel gained widespread interest because of its political message. Golding went on to write many more books, including The Inheritors, Rights of Passage and many others. He had a rather pessimistic view of humanity. His novels are often set in closed communities, such as islands, villages, monasteries, groups of hunter-gatherers, ships at sea or a pharaoh's court. Golding was knighted for his work in 1988. He died five years later, on 19 June 1993, of heart failure in Cornwall. William Golding Facts for Kids. Kiddle Encyclopedia.